The starting gates of the summer festival season, Live At Leeds has become a go-to destination to see the artists that’ll be making their mark in the months and years ahead. Guaranteed to provide festival-goers with their next favourite band, the multi-venue event has previously played host to the likes of The 1975, Bastille, James Blake, Years & Years, Rudimental, Stormzy, Sam Smith, Ed Sheeran, Rag‘n’Bone Man and more on their way to global acclaim. 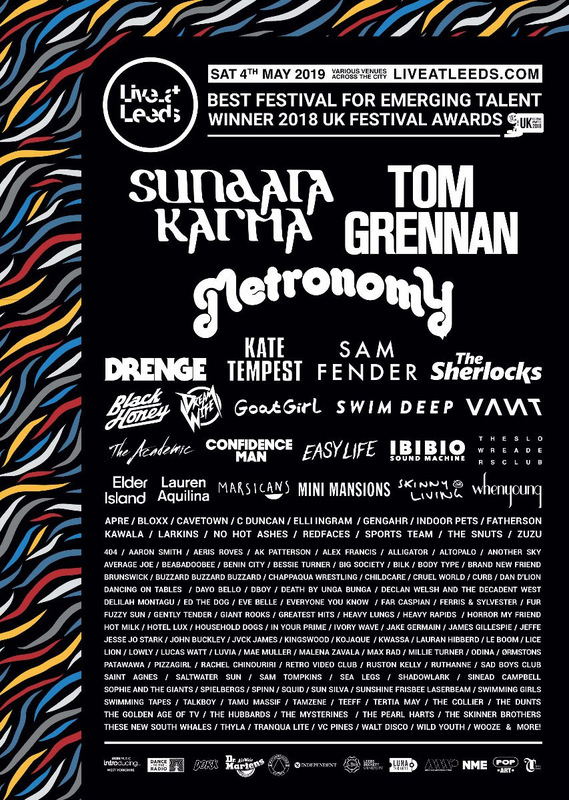 Standing as the unrivalled home of music discovery in 2019 and standing as the Best Festival For Emerging Talent (UK Festival Awards 2018), Live At Leeds once again is packed with an unrivalled lineup of the best and brightest in new and game-changing music – with the trailblazing Sundara Karma, revered game-changers Metronomy and man of the moment Tom Grennan topping a bill boasting the likes of Kate Tempest, Sam Fender, Drenge, Dream Wife, Confidence Man, Swim Deep, The Sherlocks, Black Honey, Easy Life, Sports Team, Goat Girl, Sea Girls, The Slow Readers Club, Ibibio Sound Machine, Gengahr, The Murder Capital, Another Sky, Indoor Pets, 404, Beabadoobee, Squid, Gently Tender, APRE, Lady Bird, Lauren Aquilina, She Drew The Gun and many more, all looking to make their mark across an unrivalled 24 hours in live music. Spanned across the city, Live At Leeds is the home of new music and 2019 is only set to continue that tradition with its best lineup to date!